"MotoGP" redirects here. For other uses, see MotoGP (disambiguation). Grand Prix motorcycles are purpose-built racing machines that are generally unavailable for purchase by the general public or able to be ridden legally on public roads. This contrasts with the various production-based categories of racing, such as the Superbike World Championship and the Isle of Man TT Races that feature modified versions of road-going motorcycles available to the public. A FIM Road Racing World Championship Grand Prix was first organized by the Fédération Internationale de Motocyclisme in 1949. The commercial rights are now owned by Dorna Sports, with the FIM remaining as the sport sanctioning body. Teams are represented by the International Road Racing Teams Association (IRTA) and manufacturers by the Motorcycle Sport Manufacturers Association (MSMA). Rules and changes to regulations are decided between the four entities, with Dorna casting a tie-breaking vote. In cases of technical modifications, the MSMA can unilaterally enact or veto changes by unanimous vote among its members. These four entities compose the Grand Prix Commission. There have traditionally been several races at each event for various classes of motorcycles, based on engine size, and one class for sidecars. Classes for 50 cc, 80 cc, 125 cc, 250 cc, 350 cc, and 500 cc solo machines have existed at some time, and 350 cc and 500 cc sidecars. Up through the 1950s and most of the 1960s, four-stroke engines dominated all classes. In part this was due to rules, which allowed a multiplicity of cylinders (meaning smaller pistons, producing higher revs) and a multiplicity of gears (giving narrower power bands, affording higher states of tune). In the 1960s, two-stroke engines began to take root in the smaller classes. In 1969, the FIM —citing high development costs for non-works teams— brought in new rules restricting all classes to six gears and most to two cylinders (four cylinders in the case of the 350 cc and 500 cc classes). This led to a mass walk-out of the sport by the previously highly successful Honda, Suzuki and Yamaha manufacturer teams, skewing the results tables for the next several years, with MV Agusta effectively the only works team left in the sport until Yamaha (1973) and Suzuki (1974) returned with new two-stroke designs. By this time, two-strokes completely eclipsed the four-strokes in all classes. In 1979, Honda, on its return to GP racing, made an attempt to return the four-stroke to the top class with the NR500, but this project failed, and, in 1983, even Honda was winning with a two-stroke 500. Previously, the championship featured a 50cc class from 1962 to 1983, later changed to an 80cc class from 1984 to 1989. The class was dropped for the 1990 season, after being dominated primarily by Spanish and Italian makes. It also featured a 350cc class from 1949 to 1982, and a 750 cc class from 1977 to 1979. Sidecars were dropped from world championship events in the 1990s (see Superside). From the mid-1970s through to 2001, the top class of GP racing allowed 500 cc displacement with a maximum of four cylinders, regardless of whether the engine was a two-stroke or four-stroke. This is unlike TT Formula or motocross, where two and four strokes had different engine size limits in the same class to provide similar performance. Consequently, all machines were two-strokes, since they produce power with every rotation of the crank, whereas four-stroke engines produce power only every second rotation. Some two- and three-cylinder two-stroke 500s were seen, but though they had a minimum-weight advantage under the rules, typically attained higher corner speed and could qualify well, they lacked the power of the four-cylinder machines. In 2002, rule changes were introduced to facilitate the phasing out of the 500 cc two-strokes. The premier class was rebranded MotoGP, as manufacturers were to choose between running two-stroke engines up to 500 cc or four-strokes up to 990 cc or less. Manufacturers were also permitted to employ their choice of engine configuration. Despite the increased costs of the new four-stroke engines, they were soon able to dominate their two-stroke rivals. 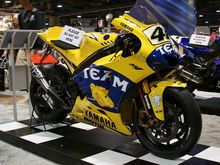 As a result, by 2003 no two-stroke machines remained in the MotoGP field. The 125 cc and 250 cc classes still consisted exclusively of two-stroke machines. In 2007, the MotoGP class had its maximum engine displacement capacity reduced to 800 cc for a minimum of five years. As a result of the 2008–2009 financial crisis, MotoGP underwent changes in an effort to cut costs. Among them are reducing Friday practice sessions and testing sessions, extending the lifespan of engines, switching to a single tyre manufacturer, and banning qualifying tyres, active suspension, launch control and ceramic composite brakes. For the 2010 season, carbon brake discs were banned. For the 2012 season, the MotoGP engine capacity was increased again to 1,000 cc. It also saw the introduction of Claiming Rule Teams (CRT), which were given more engines per season and larger fuel tanks than factory teams, but were subject to a factory team buying ("claiming") their rival's powertrain for a fixed price. The sport's governing body received applications from sixteen new teams looking to join the MotoGP class. For the 2014 season, the CRT subclass was rebranded Open, as the claiming rule was removed. Also, all entries adopted a standard engine control unit, with factory teams being allowed to run any software, and Open entries using a standard software. For the 2016 season, the Open subclass was dropped, and factory entries switched to a standard engine control unit software. In 2010, the 250cc two-stroke class was replaced by the new Moto2 600 cc four-stroke class. In 2012, the 125cc two-stroke class was replaced by the Moto3 250cc four-stroke class with a weight limit of 65 kg with fuel. According to one estimate, leasing a top-level motorcycle for a rider costs about US$3.0 to 3.5 million per season. 1949: Start of the world championship in Grand Prix motorcycle racing for five separate categories, 125cc, 250cc, 350cc, 500cc and sidecars. Harold Daniell wins the first ever 500 cc Grand Prix race held at the Isle of Man TT. 1958: MV Agusta win the constructors' and riders' championships in all four solo classes, a feat the team repeat in 1959 and 1960. 1959: Honda enters the Isle of Man TT for the first time. 1963: The 1963 Japanese Grand Prix is the first world championship race held in Asia. 1964: The 1964 United States Grand Prix is the first world championship race held in North America. 1966: Honda wins the constructors' championship in all five solo classes. Jim Redman wins Honda's first ever 500 cc Grand Prix at Hockenheim, also the first win for a Japanese factory in the premier class. 1968: Giacomo Agostini (MV Agusta) wins both the 350 cc and 500 cc titles. 1969: Godfrey Nash riding a Norton Manx becomes the last rider to win a 500 cc Grand Prix riding a single-cylinder machine. 1971: Jack Findlay rides a Suzuki TR500 to the first ever win in the 500 cc class for a two-stroke machine. 1972: as 1968. The death of Gilberto Parlotti at the Isle of Man TT causes multiple world champion Giacomo Agostini and other riders to boycott the next four events on grounds of safety. 1972: Last year of 500 cc sidecars. 1973: Deaths of Jarno Saarinen and Renzo Pasolini at the Italian round at Monza. 1974: The Suzuki RG500 is the first square-four in the 500 cc class. The constructors' title is won by a Japanese brand and a two-stroke for the first time (Yamaha). 1975: Giacomo Agostini (Yamaha) wins the 500 cc class, making Yamaha the first non European brand to the riders' championship in the premier class. 1976: Barry Sheene wins the first 500 cc championship for Suzuki. After the 1976 Isle of Man TT, the FIM gives in to the riders' boycott and removes the event from the Grand Prix calendar. 1977: 750 FIM prize becomes a world championship for 750cc machines. Barry Sheene wins the 500 cc class. The British Grand Prix moves from the Isle of Man to the Silverstone Circuit on the British mainland. 1978: Kenny Roberts (Yamaha) wins the 500 cc class, the first American to do so. 1979: Last year of the 750 cc class. 1980: Patrick Pons (Yamaha 500 cc) and Malcolm White (sidecar) are both killed at the Silverstone British GP. 1981: Marco Lucchinelli wins the 500GP world title with his Suzuki RG500 Gamma. 1982: Franco Uncini wins 500cc class world title riding a Suzuki RG500 Gamma. 1982: Last year of 350 cc class. 1983: Freddie Spencer (Honda) wins the 500 cc class. Spencer and Kenny Roberts win all 500cc races for the season between them. 1984: 50 cc class replaced by 80 cc. 1985: Freddie Spencer (Honda) wins both the 250 cc and 500 cc titles. 1987: Wayne Gardner (Honda) wins the 500 cc class, the first Australian to do so. 1988: Wayne Rainey wins the first 500 cc race using carbon brakes, at the British GP. 1988: Alfred Heck (passenger Andreas Räcke) is killed during free practice in the French Sidecar GP. 1989: Iván Palazzese (Aprilia) is killed in 250 cc West German GP at Hockenheim. 1989: Last year of 80 cc class. 1990: 500 cc grid switches from five to four bikes per row. 1992: Honda introduces the NSR500 with a big bang engine. 1993: Nobuyuki Wakai (Suzuki) is killed during the practice session of the 250 cc GP in Spain. 1994: Simon Prior, passenger of Yoshisada Kumagaya, on an LCR-ADM, is killed in a crash involving seven outfits in the Sidecar GP at Hockenheim. 1998: 500 cc switch to unleaded fuel. 1999: Àlex Crivillé (Honda) wins the 500 cc class, the first Spaniard to do so. 2000: Kenny Roberts Jr. (Suzuki) wins the 500 cc class, he joins his father Kenny Roberts to claim the championship and thus making them the only father - son to win the 500cc championship. 2002: MotoGP replaces the 500 cc class; Four-Strokes are re-introduced and get an increase to 990cc but two-strokes stay at 500cc. 2003: Daijiro Kato is killed during the Japanese GP in the MotoGP class at Suzuka when he hits the barrier at 340R (Formula One car driver Allan McNish had a serious crash during the Formula One Grand Prix the previous October there, resulting in a reprofiled 130R for 2003, known as 85R and 340R). 2004: MotoGP grid switches from four to three bikes per row while the 250cc and 125cc classes retain four bikes per row. 2007: MotoGP engine capacity is restricted to 800 cc four-strokes. Ducati wins the riders' championship with Casey Stoner and also the constructors' title, becoming the first European brand to have done so in the premier class in 30 years. 2009: Kawasaki ran a single bike as Hayate Racing Team after the factory team announced their withdrawal from the series. 2010: Moto2 replaces the 250cc GP class. All engines are built for Moto2 by Honda and are four-stroke 600cc (36.6 cu in) in-line four-cylinder based on the CBR600RR road bike, producing ~125 bhp and rev up to 16000 rpm. 2010: Moto2 rider Shoya Tomizawa is killed at Misano. 2010: Kawasaki announces its retirement due to negotiations with DORNA, stated that it will continue racing activities using mass-produced motorcycles as well as supporting general race oriented consumers. 2011: Suzuki suspend their MotoGP participation at the end of the season. 2012: The new Moto3 250 cc (15.2 cu in) four-stroke single-cylinder class replaces the 125cc class. 2012: MotoGP raises the maximum engine capacity to 1,000 cc (61 cu in) and introduces claiming rule teams. 2012: Aprilia rejoin MotoGP class as a claiming rule team (CRT). 2013: Knockout qualifying format is introduced. 2013: The 'rookie rule' introduced for the 2010 season is withdrawn. 2013: Marc Márquez becomes the first rookie to win the championship in MotoGP's current guise, and the youngest ever premier class world champion. 2015: Aprilia return to a full factory team. 2016: Michelin returns as tyre supplier after Bridgestone's withdrawal. 2016: Luis Salom dies during Moto2 practice at the Catalan Grand Prix after a high-speed impact with his own stricken bike. 2017: KTM joined the series with a factory-supported team for the first time. 2019: Triumph Motorcycles replace Honda as Moto2 engine supplier and the new engines will be 765cc (46.7 cu in) triples based on the Street Triple RS 765. 2019: Both Moto2 and Moto3 adopt the qualifying format used by MotoGP. 2019: The MotoE class is introduced using electric motorcycles. 2019: A new penalty named the "Long Lap" penalty is introduced for riders exceeding track limits during races. The starting grid is composed of three columns (four for the 125 cc and 250 cc classes) and contains approximately 20 riders. Grid positions are decided in descending order of qualifying speed, with the fastest on the pole or first position. Races last approximately 45 minutes, each race is a sprint from start to finish without pitting for fuel or tyres. In 2005, a flag-to-flag rule for MotoGP was introduced. Previously, if a race started dry and rain fell, officials could red-flag (stop) the race and either restart or resume on 'wet' tyres. Now, when rain falls, a white flag is shown, indicating that riders can pit to swap the motorcycle on which they started the race for an identical one, as long as the tyres are different (that is, intermediates or wets instead of slicks). Besides different tyres, the wet-weather bikes have steel brake rotors and different brake pads instead of the carbon discs and pads used on the 'dry' bikes. This is because the carbon brakes need to be very hot to function properly, and the water cools them too much. The suspension is also 'softened' up somewhat for the wet weather. When a rider crashes, track marshals up the track from the incident wave yellow flags, prohibiting passing in that area; one corner farther up the track, a stationary yellow flag is shown. If a fallen rider cannot be evacuated safely from the track, the race is red-flagged. Motorcycle crashes are usually one of two types: lowside, when the bike loses either front or rear tire grip and slides out on the "low" side, and the more dangerous highside, when the tires do not completely slide out, but instead grip the track surface, flipping the bike over to the "high side", usually catapulting the rider over the top. Increased use of traction control has made highsides much less frequent. Top riders travel the world to compete in the annual FIM World Championship series. The championship is perhaps most closely followed in Italy and Spain, home of many of the more successful riders early in the 21st century. As for the 2011 season, 25 riders of eight nations participated in the premier class of the championship. The Riders' World Championship is awarded to the most successful rider over a season, as determined by a points system based on Grand Prix results. Giacomo Agostini is the most successful champion in Grand Prix history, with 15 titles to his name (8 in the 500 cc class and 7 in the 350 cc class). The most dominant rider of all time was Mike Hailwood, winning 10 out of 12 (83%) races, in the 250 cc class, in the 1966 season. Mick Doohan, who won 12 out of 15 (80%) of the 500 cc races in the 1997 Grand Prix motorcycle racing season also deserves an honourable mention. 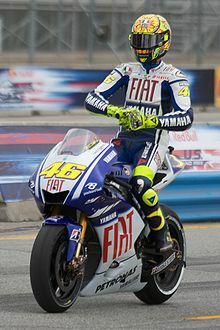 Valentino Rossi is the most successful contemporary rider, having won nine titles including six MotoGP titles, and one each at 500 cc, 250 cc and 125 cc levels. The current (2018) champion is Spanish Marc Márquez (5x MotoGP 1x Moto2; 1x 125 cc): 7 titles. The 2019 MotoGP season consists of 19 Grand Prix held in 16 different countries, the same as in the previous season. The following shows the key technical regulations for each class. It was also introduced for the 2005 year, that under rule 2.10.5: 'No fuel on the motorcycle may be more than 15 °C below ambient temperature. The use of any device on the motorcycle to artificially decrease the temperature of the fuel below ambient temperature is forbidden. No motorcycle may include such a device.' This stops an artificial "boost" gained from increasing fuel density by cooling it. At the beginning of the new MotoGP era in 2002, 500 cc two-stroke or 990 cc four-stroke bikes were specified to race. The enormous power advantage of the twice as large displacement four-stroke engine over the half the size two-stroke meant that by the following season, no two-stroke bikes were racing. In 2007, the maximum engine capacity was reduced to 800 cc without reducing the existing weight restriction. In 2002, the FIM became concerned at the advances in design and engineering that resulted in higher speeds around the race track; regulation changes related to weight, amount of available fuel and engine capacity were introduced. The amended rules reduced engine capacity to 800 cc from 990 cc and restricted the amount of available fuel for race distance from 26 litres (5.7 imp gal; 6.9 US gal) in year 2004 to 21 litres (4.6 imp gal; 5.5 US gal) in year 2007 and onwards. In addition, the minimum weight of four-cylinder bikes used by all participating teams was increased by 3 kg (6.6 lb). The highest speed for a MotoGP motorcycle in 125 cc category is 249.76 km/h (155.19 mph) by Valentino Rossi in 1996 for Aprilia and the top speed in the history of MotoGP is 356.4 km/h (221.5 mph), set by Andrea Dovizioso, during the race at the 2018 Italian Grand Prix. On December 11, 2009, the Grand Prix Commission announced that the MotoGP class would switch to the 1,000 cc motor limit starting in the 2012 season. Maximum displacement was limited to 1,000 cc, maximum cylinders were limited to four, and maximum bore was capped at 81 mm (3.2 inches). Carmelo Ezpeleta, the CEO of Dorna Sports, indicated that the projected changes were received by the teams favorably. From 2012, teams not entered by one of the major manufacturers could seek "claiming rule team" (CRT) status. Claiming rule team were intended to allow independent teams to be competitive at a lower cost and increase the number of entries in MotoGP. Claiming rule teams benefitted from less restrictive rules on the number of engines that could be used in a season, and with larger fuel allowances during the races. Under the claiming rule, CRTs agree to allow up to four of their engines per season to be claimed, after a race, by one of the major manufacturer teams at a cost of €20,000 each including transmission, or €15,000 each for the engine alone. From the 2014 season, the CRT class was dropped in favour of an "Open Class" specification - allowing teams using the control ECU hardware and software certain benefits to increase their competitiveness. Moto2 (also known as 600cc class) is the 600 cc four-stroke class, launched in 2010 to replace the traditional 250 cc two-stroke class. Engines were supplied exclusively by Honda, tyres by Dunlop and electronics are limited and supplied only by FIM sanctioned producers with a maximum cost set at 650 EUR. Carbon brake discs are banned, only steel brake discs are allowed. However, there are no chassis limitations. From 2010 onwards, only 600 cc four-stroke Moto2 machines have been allowed. In 2019 Triumph replaced Honda as the sole supplier of Moto2 engines. The Triumph engine boasts 765cc displacement with 3 cylinders in contrast with the previous Honda's 600cc in-line four. The 125 cc class was replaced in 2012 by the Moto3 class. This class is restricted to single-cylinder 250 cc four-stroke engines with a maximum bore of 81 mm (3.2 inches). The minimum total weight for motorcycle and rider is 148 kg (326 lb). Riders in the Moto3 class cannot be older than 28 years, or 25 years for new contracted riders participating for the first time and wild-cards. The MotoE World Cup is introduced in 2019 and features all-electric motorcycles. The series will be using a spec Energica Ego Corsa motorcycle, manufactured by Energica Motor Company. The first season is contested over 6 rounds (at 5 different Grand Prix weekends). From 2007 onwards, and for a minimum period of five years, FIM has regulated in MotoGP class that two-stroke bikes will no longer be allowed. The maximum fuel capacity is to be 21 litres (4.6 imp gal; 5.5 US gal). Tyre selection is critical, usually done by the individual rider based on bike 'feel' during practice, qualifying and the pre-race warm-up laps on the morning of the race, as well as the predicted weather. The typical compromise is between grip and longevity—softer compound tyres have more traction, but wear out more quickly; harder compound tyres have less traction, but are more likely to last the entire race. Conserving rubber throughout a race is a specific skill winning riders acquire. Special 'Q' or qualifying tyres of extreme softness and grip were typically used during grid-qualifying sessions until their use was discontinued at the end of the 2008 season, but they lasted typically no longer than one or two laps, though they could deliver higher qualifying speeds. In wet conditions, special tires ('wets') with full treads are used, but they suffer extreme wear if the track dries out. In 2007 new MotoGP regulations limited the number of tyres any rider could use over the practice and qualifying period, and the race itself, to a maximum of 31 tyres (14 fronts and 17 rears) per rider. This introduced a problem of tyre choice versus weather (among other factors) that challenges riders and teams to optimize their performance on race day. This factor was greeted with varying degrees of enthusiasm by participants. Bridgestone had dominated in 2007 and Michelin riders Valentino Rossi, Nicky Hayden, Dani Pedrosa, and Colin Edwards all acknowledged shortcomings in Michelin's race tyres relative to Bridgestone. Rossi, disappointed with and critical of the performance of his Michelin tyres, switched to Bridgestones for 2008 and won the world championship in dominant fashion. Pedrosa switched to Bridgestones during the 2008 season. In 2008, the rules were amended to allow more tyres per race weekend—18 fronts and 22 rears for a total of 40 tyres. The lower number of tyres per weekend was considered a handicap to Michelin riders. The only MotoGP team using Dunlop tyres in 2007, Yamaha Tech 3, did not use them in 2008 but switched to Michelin. For 2009, 2010 and 2011, a 'spec' tyre supplier, Bridgestone, was appointed by the FIM (with Michelin no longer supplying any tyres to MotoGP). For the whole season Bridgestone provided four different specifications of front tyre, six of rear, and a single wet specification—with no qualifying specification. For each round Bridgestone provided only two specifications for front and rear. Tyres are assigned to riders randomly to assure impartiality. Jorge Lorenzo has publicly supported the mono tyre rule. At the end of the 2015 season, Bridgestone withdrew as tyre supplier of MotoGP. Following a formal tender, French tyre manufacturer Michelin became the official supplier for the 2016 season, and testing began in Aragon immediately after the end of the 2015 season. MotoGP motorcycles are estimated to be worth approximately US$2 million, although executives within MotoGP have deemed them priceless due in part that they are prototypes and cannot easily be replicated. Hitting the Apex, a documentary film about MotoGP, was released in 2015 and is now available on DVD. Faster, a documentary film about MotoGP, was released in 2003 and is now available on DVD. Fastest, a documentary film about MotoGP, was released in 2011 and is now available on DVD. MotoGP 2010, a iOS game made in 2010 by I-Play, released on September 3, 2010 and was not received well by critics after having a 43% rating on Metacritic. MotoGP 2010/2011 was released by Capcom on March 15, 2011, for the PlayStation 3 and Xbox 360. Metacritic gave the game a rating of 72%. MotoGP 13 was released on June 21, 2013 on PlayStation Vita, PlayStation 3, and Xbox 360. The game received mixed reviews and scored 73%.. The current MotoGP game is MotoGP 18. It received mixed reviews and was released on June 7, 2018. Another installment, MotoGP 19, will be released on June 6, 2019. ^ a b c Maurice Büla, ed. (2001). Continental Circus 1949-2000. Jean-Claude Schertenleib. Chronosports S.A. p. 18. ISBN 2940125767. ^ "Pioneer gun store and cyclery has greatly increased in size". The Bakersfield Californian. Heritage Microfilm, Inc.#NewspaperARCHIVE. 26 April 1913. (Subscription required (help)). The most notable Indian triumph of 1912 was the winning of the French classic motorcycle event, the Grand Prix. ^ "Inside MotoGP. History". motogp.com. Archived from the original on 24 March 2016. Retrieved 10 September 2017. ^ Noyes, Dennis (2007-12-21). "MOTOGP: Dorna CEO Advocates Limits on Electronics in MotoGP". SPEEDTV.com. Archived from the original on 2008-05-06. Retrieved 2008-03-04. ^ "FIM announce changes to 2009 regulations". MotoGP.com. 2009-02-18. Retrieved 2009-02-18. ^ "MotoGP increases engine size to 1,000 cc in 2012". BBC Sport. 10 January 2010. ^ "Corrado Cecchinelli talks CRT regulations". MotoGP.com. Dorna Sports. 3 May 2011. Retrieved 9 November 2011. ^ Beer, Matt (1 May 2011). "New teams lining up for MotoGP 2012". Autosport. Haymarket Publications. Retrieved 22 June 2011. ^ THE IDIOT’S GUIDE TO MOTOGP: How to increase costs and decrease speed (Part II) sportbikes.net Moto GP News 3 January 2006. ^ a b c d e "MotoGP Milestones". crash.net. Retrieved 29 January 2016. ^ "FIM History Flash Back 1796-1979". FIM-live.com. Archived from the original on 18 February 2017. Retrieved 10 September 2017. ^ "Bridgestone make proposal to be single tyre supplier in 2009". MotoGP. 4 October 2008. Retrieved October 10, 2008. ^ "Michelin will not bid for the contract to be single-source supplier of tyres for the MotoGP World Championship". Michelin. 4 October 2008. Retrieved October 10, 2008. ^ "Rule changes prevent rookie factory riders". crash.net. Retrieved 26 July 2017. ^ "Simoncelli dies from injuries". Yahoo!. October 23, 2011. Retrieved 23 October 2011. ^ "MotoGP changes for 2012". MotoGP. 11 December 2009. Retrieved March 16, 2011. ^ "MotoGP announces knockout style qualifying". Crash.net. Crash Media Group. 14 October 2012. Retrieved 14 October 2012. ^ "Honda Worldwide | MotoGP 2005 Round 02: Portugal GP". world.honda.com. Retrieved 11 June 2018. ^ MotoGP. "Valentino Rossi". MotoGP Rider Profiles. Dorna Sports S.L. Retrieved 2012-05-15. ^ "Event Best Maximum Speed" (PDF). MotoGP.com. 2016-03-20. Retrieved 2014-06-02. ^ "MotoGP Goes Back to 1,000 cc in 2012". Motorcycle-usa.com. Retrieved 2014-05-27. ^ " MOTOGP: Rossi Quickest As Sepang Test Concludes," Archived 2010-07-31 at the Wayback Machine SPEEDtv.com (2010). ^ "Corrado Cecchinelli talks CRT regulations". MotoGP.com. 2011-05-03. Retrieved 2011-12-17. ^ "Triumph announced as Moto2 engine supplier from 2019". motogp.com. 2017-06-03. ^ "Dorna Launches FIM Enel MotoE World Cup Bike In Italy". cycleworld.com. Retrieved 2018-02-07. ^ "Discover the Energica Ego Corsa MotoE™ motorcycle!". MotoGP. Retrieved 5 November 2018. ^ a b Sports, Dorna. "Inside MotoGP™ · Bikes". www.motogp.com. Retrieved 2016-04-02. ^ "MotoGP™ software development freeze for mid-2015". ^ "Bridgestone: How MotoGP Spec Tyres Will Work". SuperbikePlanet.com. 2009-02-04. Archived from the original on February 7, 2009. Retrieved February 4, 2009. ^ "Bridgestone to withdraw from MotoGP™ after the 2015 season". MotoGP.com. Retrieved February 24, 2016. ^ "Michelin to become MotoGP™ Official Tyre supplier". MotoGP.com. Retrieved February 24, 2016. ^ "MotoGP 10/11". Metacritic. Retrieved 13 March 2019. ^ "MotoGP 19 - The Official Videogame". MotoGP Videogame. Retrieved 7 April 2019. This page is based on the Wikipedia article Grand Prix motorcycle racing; it is used under the Creative Commons Attribution-ShareAlike 3.0 Unported License (CC-BY-SA). You may redistribute it, verbatim or modified, providing that you comply with the terms of the CC-BY-SA.